When you think about a rollaway guest bed, what comes to your mind? Maybe staying over at your grandparent’s house as a child or maybe sleepovers at a friend’s house? 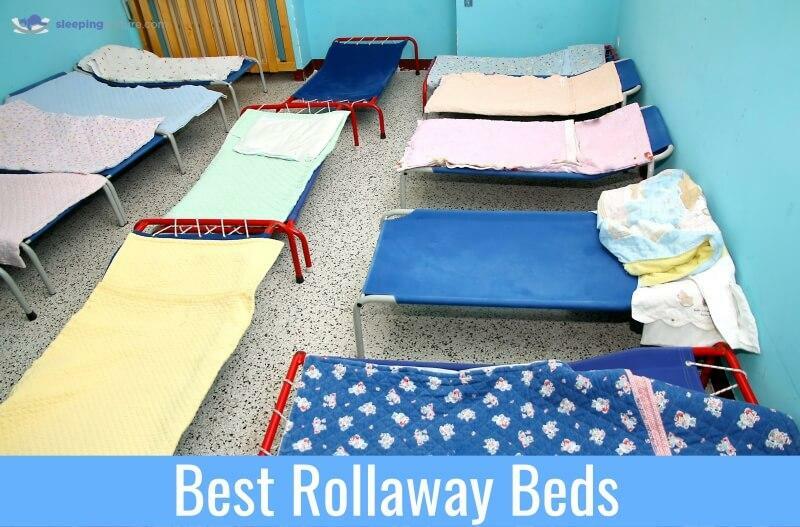 Most of us probably have some sort of memory of sleeping on a rollaway bed as a child, and most of us probably remember those beds being absolutely uncomfortable. We remember uncomfortable mattresses and cold, loud springs holding them together or the feeling that the bed might break anytime that you rolled over. Well, the good news is that rollaway beds have certainly come a long way since those days. Nowadays there are some very high-quality options available on the market with comfortable mattresses and top notch designs that your future guests are certain to enjoy. Our top choice is Milliard’s Diplomat Twin Size Folding Bed due to its luxurious memory foam mattress, its comfort, convenience and unique frame design. What factors should you consider before purchasing? Comfort: This factor is probably obvious when buying a bed. How many times have you stayed over someone’s home and their guest bed is very uncomfortable? Do you want to be one of those people, who’s guests can’t fall asleep all night because they are so uncomfortable? Of course, you don’t want to be. You would much rather your guests leave feeling refreshed and commenting about how comfortable your rollaway bed is. Find a model that you would want to sleep on if you were staying at someone else’s house. Size: Despite popular belief, rollaway beds do come in multiple sizes. The most common ones are twin and cot, cot being a bit smaller than a full-size twin. There are also double sizes as well, but they are rarer and usually more expensive. That being said though, think about what kind of guests you are usually hosting and then buy the appropriate size for that. Will it last? There are plenty of quality options out there for you to choose from. Choose one that seems like it will hold up and last for many years to come. No guest wants to be the one who breaks their host’s bed, so it’s better to not even put them in that position, by buying a bed that will hold up over time. Get one with a heavy duty metal frame, this will ensure that your guest has plenty of support. How convenient is it to store? The whole point of rollaway beds is that we simply roll them out when someone comes and then roll them back into storage when they leave. Look for an option is is easy and convenient to put out when someone comes but also packs up compactly so that you can easily store it. The wheels on them will all be different, so make sure that you pick one where the wheels run smooth and will transport around your house easily. The Milliard Diplomat will provide you with plenty of comfort, support and portability. The 5 inch medium-firm mattress is made from composite memory foam to give your guest the most comfortable night’s sleep. The strong and sturdy frame is made from high quality steel that is double reinforced at the base. This ensures that it will stay stable, durable and won’t sag over time. The Diplomat features a unique “wire latticed” support to give your guest’s back extra support. This eliminates the “sinking feeling” that often comes with rollaway beds. 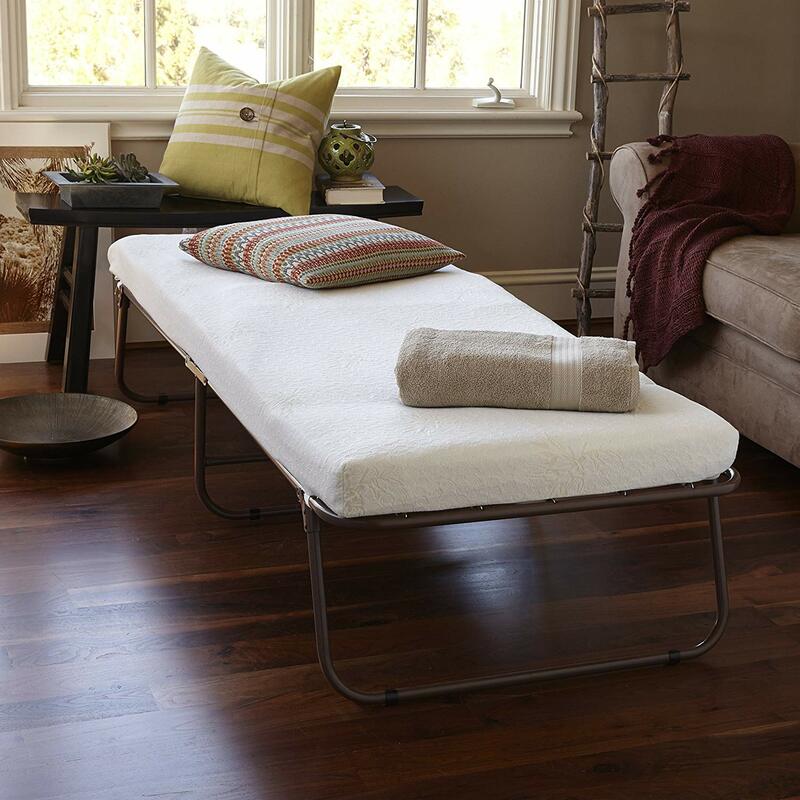 You won’t ever have to dread pulling this bed out of storage. Both storage and set-up are a breeze thanks in part to the fact that the wheels pivot 360 degrees, to ensure smooth transportation. Not to mention, the Diplomat folds up to a convenient width of 14 inches and can easily be stored in any closet when it is not needed. 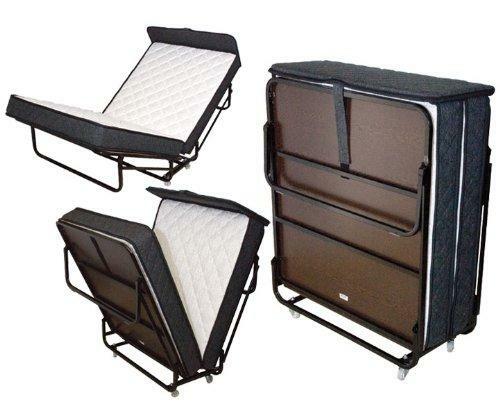 The Zinus Sleep Master Resort is designed for ultimate comfort, style, and durability. It comes with a 5 inch thick foam mattress. 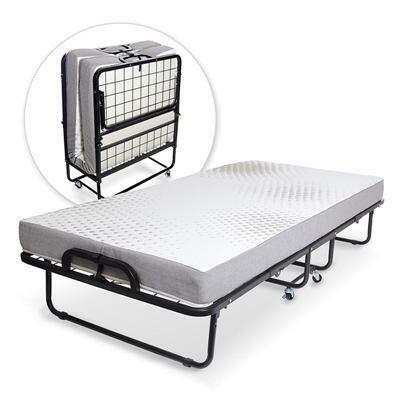 This is compiled of a 4 inch layer of high density support foam, topped with a 1 inch layer of memory foam, to give both support and comfort to the sleeper. As opposed to many rollaway beds out there, the Resort is designed to look like a box spring with a cover. To achieve this, they take their solid steel frame and apply a grey powder coat finish to it. They then cover both the mattress and the frame in a matching gingham print fabric. Just by looking at this bed, no one will ever know that it is a rollaway bed! 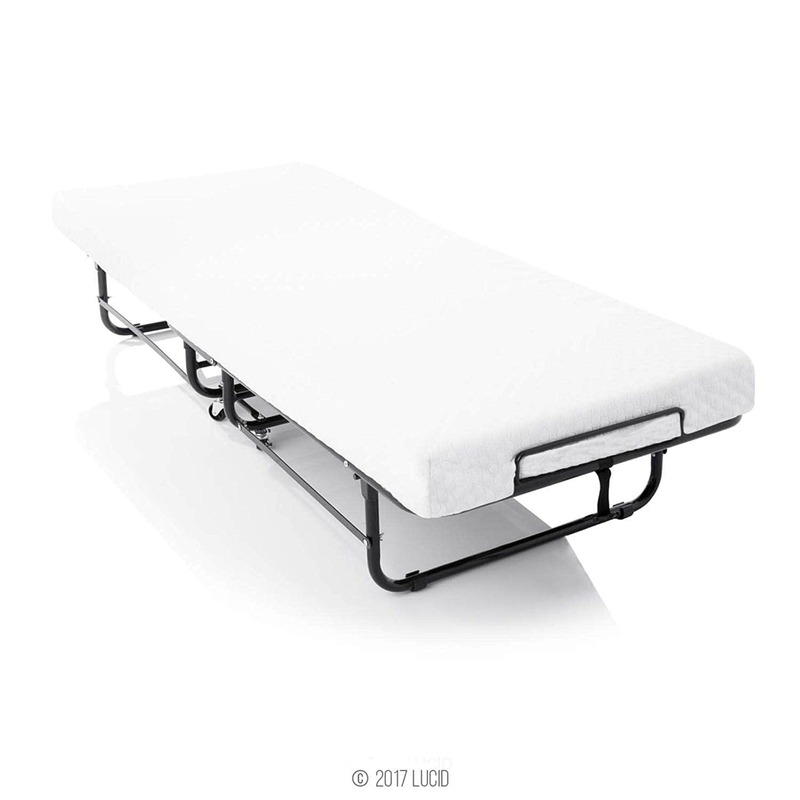 The Lucid features a 4 inch mattress, made up of 3 inches of support foam and 1 inch of memory foam. This medium-firmness mattress is designed to be both soft and ultra supportive. On the bottom of the mattress cover, they have also added a non-slip textured surface that keeps the mattress in place on the frame. The frame on the Lucid is not only sturdy, but it is lightweight and easy to move. The wheels can lock into place for added safety when it is being used. 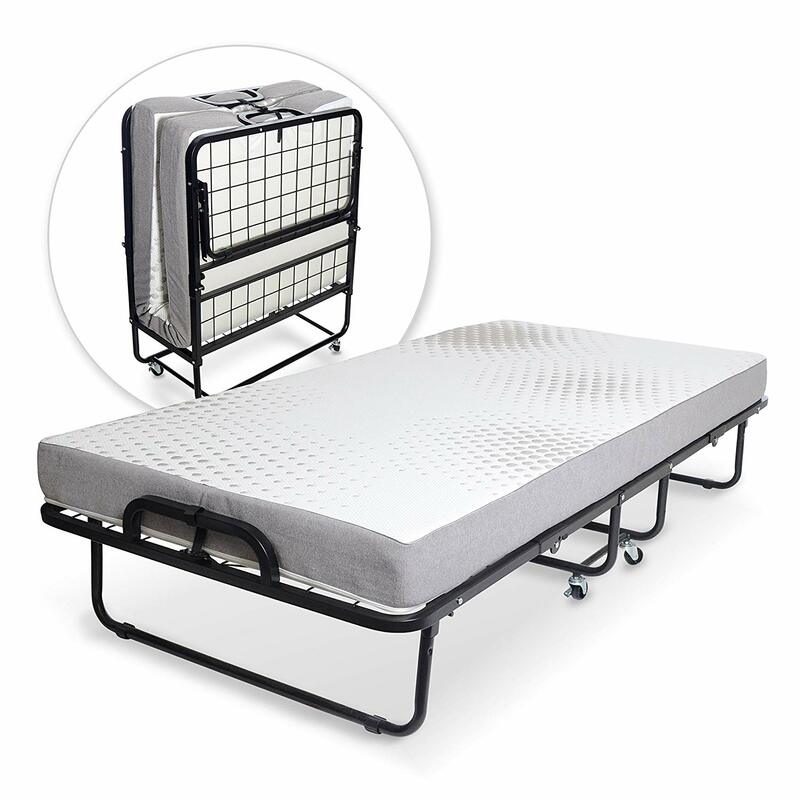 Its available in cot, twin and xl twin sizes and also comes with a 10-year warranty. The Zinus Weekender is a good option at a great price! Although not a memory foam mattress, like some of our other options, this does come with a very comfortable 4 inch foam mattress. This is made up of 3 inches of pressure relieving comfort foam, for support, topped with 1 inch of fiber padding. Your guests will have no complaints with the comfort of this bed! The frame is made from deluxe steel, and the wheels allow for easy transport. These wheels are uniquely positioned on the frame so that the legs do not move around on the floor when the bed is opened. The Weekender also comes with a bonus storage bag. This helps keep it compact and packaged away for easy storage in any closet. Canvas is not reinforced where the springs connect to the mattress. Spare no expense on your guest’s comfort with this luxurious Edward Rollaway bed! This rollaway bed is longer and wider than most, to give the sleeper plenty of room to move around comfortably. It features a very comfortable 5.5-inch box spring mattress that will rival even the comfort of a regular bed! The heavy duty frame has a weight capacity of 300 pounds, there are no worries for heavier guests. They achieve this by topping the metal support frame with a solid masonite fiberboard, to give the mattress extra support. This bed has been designed so that the sleeper feels as though they are sleeping in a regular bed, yet still giving you all the convenience of a rollaway bed. If you are someone looking to give your guest all the comforts and conveniences of their own home, then these will be some great rollaway bed options for you to consider. You no longer have to make concessions on comfort for convenience’s sake. All of these rollaway beds will offer your guest a chance at a comfortable and refreshing night’s sleep and leave them already looking forward to the next time they will be spending the night at your home!